When the person at the front desk closes with “… and make sure you check out our men’s bathroom. It’s just down the hall to the right of the big red penguin” you know you are in a unique place. 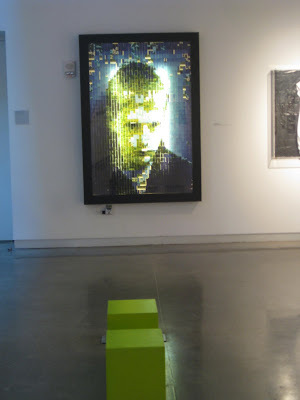 And so began a recent visit, my first, to the 21c Museum Hotel in Louisville. When the opportunity presented itself to stay a night 100 miles southwest, there was no more obvious choice as to where to stay for an evening. After all, as much as it was a glimpse into a unique place, this was a glimpse into the future. When the 21c Museum Hotel announced late last year that they had purchased the old Metropole Hotel building from 3CDC in the Backstage District it marked the first new hotel in downtown Cincinnati in over twenty years. Located across from the Aronoff Center for the Arts and just next door to the Contemporary Arts Center, the historic building offers the ability to do many unique things which is right up the alley for 21c. Penguins, penguins, and more penguins at the 21c Museum Hotel in Louisville. “3CDC approached us with the location, and it was pretty much a dream”, said CEO Michael Bonadies. And after experiencing the 21c firsthand, there is no question about that assessment. With 90 rooms in Louisville (the Cincinnati location is slated for 160), the 21c is likely to be classified as a boutique hotel given its size. It is however, so much more. “Our goal is to be a part of the community and really be one of the cultural centers of Louisville,” Bonadies said and their approach is right in line with that vision. With 90 percent of their food and beverage revenues at Proof on Main coming from local residents, their strategy is clearly a resounding success. Additionally, they host shows and events quite frequently to keep the locals coming back time and time again. The first ground floor and the level below are filled with art and exhibits that are rotated semi-annually including quite a few rooms that are big enough to hold an entire collection from an artist. On a tour we were told that this is a focus for 21c so that the patrons can get a full picture of what the artist was going after. 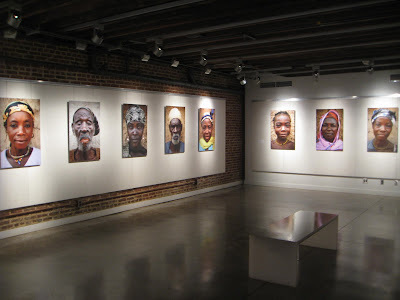 One example was the Faces of Fooshegu which was a dynamic collection of twenty portraits of the people of Tamale, Ghana. 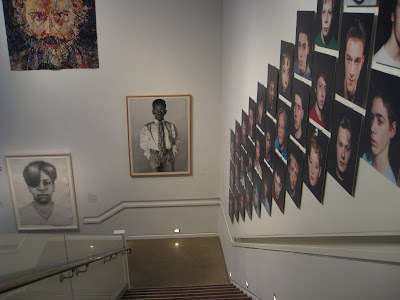 This exhibit, among quite a few others at 21c was done by local Louisville artists. 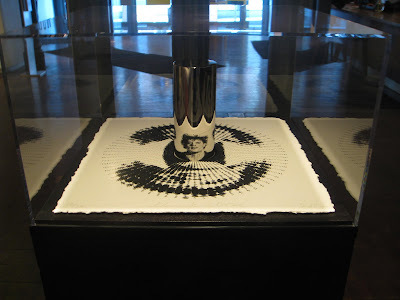 Artwork fills the 21c Museum Hotel in Louisville, and will certainly do so in Cincinnati as well. 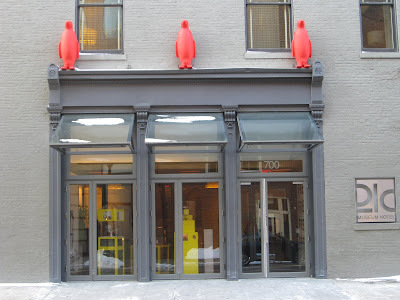 “21c reflects Louisville” said Mr. Bonadies, “and the Cincinnati location will reflect Cincinnati.” The Louisville location was opened in 2005 and the goal is to have the Cincinnati 21c open in 2012. There are a few other things coming in 2012 for Cincinnati's urban core, and this is yet another piece to our wonderful puzzle. One may ask where the vision for something like 21c comes from, which also is planning an Austin location. According to Michael, owners Laura Lee Brown and her husband Steve Wilson have a passion for the farmland of America and want to make the urban centers a place where people work, play and live. 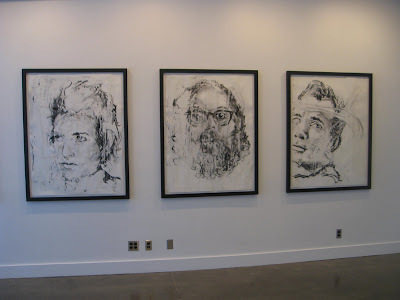 "They are doing their part to prevent urban sprawl and in turn protect the farmland they care about," said Bonadies who also stated that aside from their passion for farmland, they have a passion for art as most of what is shown at 21c is a personal reflection of their tastes. 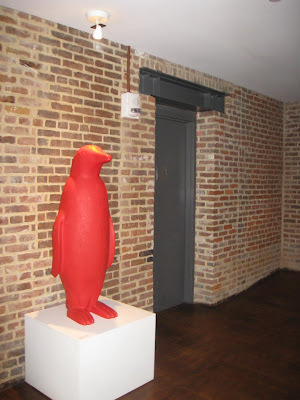 Just down the hall and to the right, you'll find the big red penguin and the famous men's restroom at the 21c Museum Hotel in Louisville. “There is art around every corner. Enjoy your stay,” Bonadies said, and he could not have been more right. 21c Museum Hotel is visually stunning, thought provoking, fun, and quite impressive, and that is all before you get in the elevator to go to head upstairs to your room. The rooms themselves are stylish and modern with an artistic touch that is all their own. As for the men’s restroom in the lobby, you will just have to go down to Louisville to see it for yourself. It's just down the hall and to the right of the big red penguin. The red penguins remind me of Youngstown. There are a number of painted penguin statues around our the Mahoning Valley area which were created as sort of a community identity project. I think Cincinnati did something similar with the flying pigs? Awesome! Love the photos, great stuff! Yes, Dave, Cincinnati does have a number of decorated pigs around town. Not sure on the full sotry, but I seem to remember someone telling me that the program, modeled after dozens of other cities, was a fundraiser of sorts. Buffalo did this with Buffalo, oddle enough. Somewhere else used moose. Kinda of a cool civic pride move, I think. Those projects are fun and put art just about everywhere which is great. Louisville actually seemed to have something similar going on with horses during our visit. Of course, Cincy had the pigs but this year will be hosting pianos which promises to be interesting. 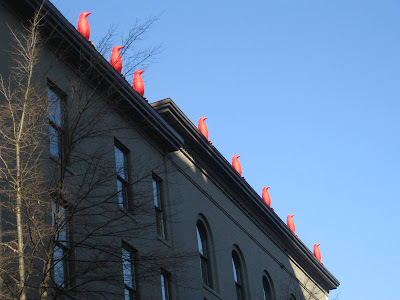 The red penguins are not a city-wide campaign in Louisville. They are all around 21C. It is their shtick. As a city, Louisville has had two campaigns with Gallopalooza, where eclectically decorated horses have been around the city. I hope you checked out the award winning restrooms.